Part of my growing collection. Looking for a great hunting book? I have compiled a list of some of the best hunting books of all time. Whether you are looking for a book to improve your success in the field or that you can enjoy by the fire this list has you covered. I have learned so much valuable information about hunting from reading books. Reading the best hunting books is like getting personal tips for some of the greatest hunters of all time. Hopefully, with any luck after a few of these books your buddies will be wondering what the heck happened. The deer hunting tactics outlined in this book will forever change the way you view deer hunting. Brad breaks down how you can use topographic maps and aerial photos to significantly improve your success in the woods. The first time I read this book it blew my mind. I had no idea how powerful maps could be. The information contained in this book is stuff you could spend your entire life hunting and never figure out. Brad guides you through how to read topographic maps and then expands on all of various patterns such as saddles, benches, and corners and how/when to hunt them. If you want to greatly improve your success in the woods you need to get this book. The subtitle of this book is 301 essential skill and it delivers exactly that. It is full of tips for hunting deer. No matter your level of hunting experience, every hunter can learn something from this book. It gives a great overview of how to hunt deer and what it takes to become a better hunter. Topics like scouting, food plots, scrapes, behavioral studies, field dressing. This book would be especially helpful if you don’t have a good hunting mentor to learn from. The Total Deer Hunter Manual is probably the most well rounded book of the three. It is one of the best deer hunting books ever written. It contains the answers to many questions beginner hunters have but are often too embarrassed to ask more experienced hunters. If you are new to hunting reading this book is probably the single best thing you can do to improve you chances. And the high quality paper and photos are a nice bonus. Even though this book is specifically written about blacktail deer, Boyd’s book covers everything from the best hunting calibers to hunter ethics. The section on still hunting is so vitally important and something that so many hunters get wrong. Boyd urges us to “Forget the fast-paced world you’ve left, slip into the slow-paced life of the woods, and follow the natural pattern of animal movement. A good rule to hunt by is: never move faster than the pace of an undisturbed deer!” That chapter alone is worth more than the price of the book. He also goes into stand hunting strategies, tracking tips, weapon and optic choice as well as the effect of the moon, wind and weather on your chances for success. Even though the book is specifically about blacktail deer those than hunt muleys or whitetail should have plenty to take away. There are also some nice high quality photos of bucks that readers have taken thanks to the hunting tips in Boyd’s first book. Once all your hard work pays off and you are ready to cook the meat you harvested you need to checkout Buck, Buck, Moose by Hank Shaw. Hank starts off by guiding you through butchering your game step by step with great detail. He also discusses how long you should be aging your deer and how to store venison. After that he goes through what seem like countless options for preparing venison. There are recipes for bone broths and stocks, roasts, stews, sausage and much more. There is even a section on organ meat with recipes like deer camp liver and onions and braised venison tongue. Once you finish reading this book you no longer have an excuse to throw your meat in the grinder. Take pride in preparing your game and treat your palate by reading this book. You have been hunting for a few years now and so far haven’t had much luck? Or you don’t have much experience and hence much confidence in how to get a deer? Tired of searching for deer hunting tips and tricks and not getting the success you are hoping for? Step one is to learn and one of the best ways to learn is to read books on deer hunting. The right resources to learn from can make all the difference and the books listed here are full of deer hunting strategies and tactics. Step two is to actually go out and apply the deer hunting tactics and reflect on how they work for you. A lot of hunters will talk a big game when it comes to how to hunt deer but as soon as they get out in the field they romp through the forest like they are trying out for the Ohio State marching band. They might get lucky once in awhile but they may also go years without killing a buck. You need a mixture of both theory and practice. You can read books all day long but if you never go out in the woods you will not succeed. There are so many facets which go into becoming a better hunter. When choosing what we think are the best deer hunting books we wanted books that covered the aspects we have found to be most important. The topics include scouting, using maps, reading the trail and weather, field dressing, and many others. 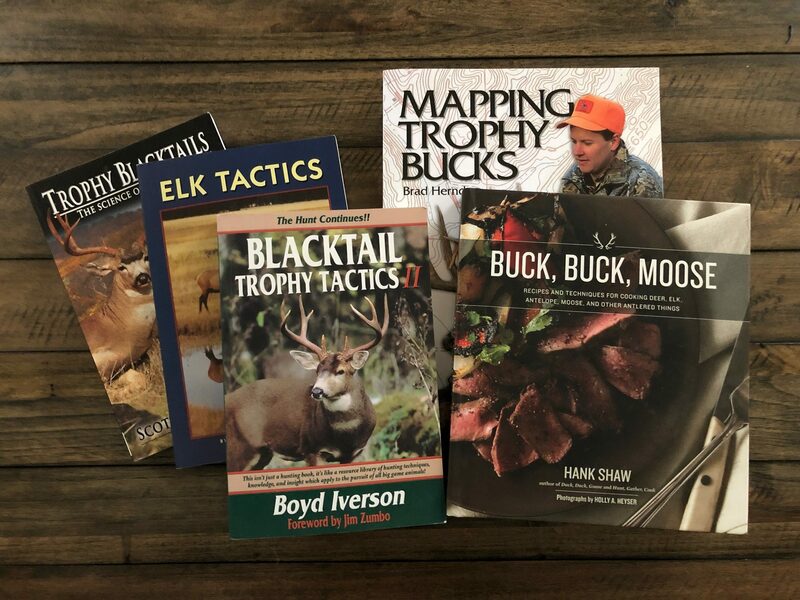 If you spend the time to learn what is in the books below you will be leaps and bounds ahead of 90% of other hunters out there. So now you have all the tools and deer hunting tips you need. You no longer have to wonder how to see more deer. Get out in the woods and work on applying what you learned. You are practically guaranteed to have more success this season.